Be the first to share your favorite memory, photo or story of HERSHEL. This memorial page is dedicated for family, friends and future generations to celebrate the life of their loved one. Mr. Hershel H. Combs, age 100 years, 6 months, and 8 days, went home to be with the Lord on Sunday, January 20, 2019, in his home, with much help and care from in home hospice care. He was born on July 12, 1918 in Fair Play, Missouri, the son of Roy Esley and Mertie (Davis) Combs. Hershel grew up around Bolivar, Missouri, but also spent some time in Iowa working on his uncle’s farm before World War II started. When the U.S. entered into World War II, Hershel served in the Medical Corp during his hitch in the Army, landing on the Normandy beach and went all the way through to the Battle of the Bulge. During his time in service, Hershel received several medals. The one he cherished most was his Bronze Star. He was a quiet but a very true American. When Hershel returned home from war to Bolivar, Missouri, he met the love of his life, Nina Birdsong, and they shared all of life’s experiences together for the next 72 years. Hershel and Nina moved to Lenexa, Kansas and he worked at the Sunflower Ammunition Plant. After about four years of dealing with Nitro Glycerin, Hershel got on at one of the local truck lines, and finally retired from Interstate Motor Lines in 1975. Hershel and Nina then decided to move to Republic, Missouri, and he loved to work so he went on to work for the Republic Schools as the manager of the School Bus Barn. After two years at that, Hershel was approached by the owner of Republic Ford to lead up the Dealer Trade car group, and finally retired at the age of 92. Hershel was a strong-willed man and a God-fearing man. One of his most profound times in his 100 years was when he attended a church revival when he was 16 and after the third night of attending, Hershel got saved. He remained a Missionary Baptist from that time on. And now, 86 years later, Hershel is finally in the presence of God Almighty and bowing before Jesus saying, “Oh Lord, How Great Thou Art.” He was member of the Mt. Olive Church, Fair Grove, Missouri, and has been for the last twenty or so years. He loved the church very much. He was preceded in death by a son, Jimmy Combs; an infant daughter, Betty Lou Combs; a grandson, Douglas Roy Combs; his parents; two brothers, Ernest Combs and Wilbert Combs; and three sisters, Marie Bridges, Floretta Pierce, and Anna Lee Collins. Hershel is survived by his wife, Nina Combs, Republic; four children and their spouses, Kathy (Phillip) Roberts, Michael (Anette) Combs, Dana (Allen) Fortner, and LeRoy (Robin) Combs; eight grandchildren; five great grandchildren; two great-great grandchildren; many nieces and nephews; and many other relatives and friends. 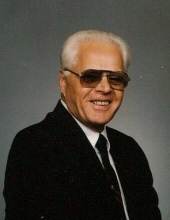 To send flowers or a remembrance gift to the family of HERSHEL H. COMBS, please visit our Tribute Store. "Email Address" would like to share the life celebration of HERSHEL H. COMBS. Click on the "link" to go to share a favorite memory or leave a condolence message for the family.